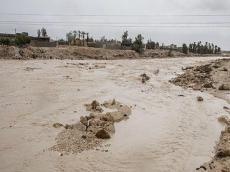 Iran's Minister of Economic Affairs and Finance Farhad Dejpasand has announced that around $7.1 million has been assigned to compensate for the flood-related damages in the Golestan Province. Speaking at the Gonbad-e Kavus crisis center he said that there should be resolutions to provide for the needs of flood-affected people. "The volume and vastness of flood was multiple times more than in the previous year, but fortunately, there were less of damage and injuries than before," he said, Trend reports citing Mehr News Agency. "Considering power and water shortage, and living in the mud, it is natural that the people are complaining," said Dejpasand. "In addition to $1.1 million of financial aid provided to the area, $7.1 million has been assigned to compensate for the destruction of infrastructure in the province. The insurance would also over compensation for the flood damages. ", he added.